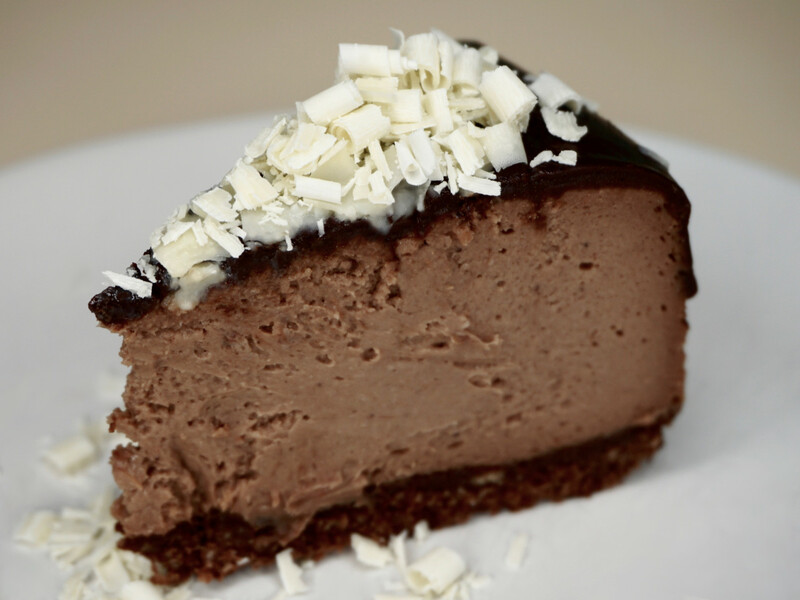 Enjoy a slice of this indulgent chocolate cheesecake with an Irish Coffee. 1) Preheat the oven to 350ºF. Butter a 9” springform pan. 2) In a large mixing bowl, combine the shortbread crumbs, powdered sugar, and cocoa powder. Add the melted butter and stir until the ingredients are evenly combined. 3) Pat the crust mixture into the bottom of the buttered springform pan. Prebake the crust for 15 minutes. Set aside to cool while you prepare the cheesecake filling. 1) Increase the oven temperature to 450ºF. Fill a large glass baking dish halfway with water and place in the oven, on the lower rack. 2) In the bowl of a standing mixer fitted with the whisk attachment, combine the cream cheese, sugar, cocoa powder, and flour. Whisk at medium speed until even and smooth, about 1–2 minutes. Take care not to overwork the mixture. 3) Add the eggs one at a time, allowing them to fully incorporate after each addition. Turn the mixer off and scrape down the sides of the bowl. 4) With the mixer speed set to low, add the sour cream and Bailey’s and mix until just evenly incorporated. 5) Pour the cheesecake filling over the prebaked shortbread crust. Place the cheesecake in the oven on the upper rack and bake for 10 minutes. Reduce the oven temperature to 250ºF and bake until set, approximately 60 minutes. 6) Remove the cheesecake from the oven. Run a knife carefully around the collar of the springform to loosen the cake from the pan. Let cool completely, then remove from the pan and top with the ganache. 1) In a medium microwave-safe bowl, combine the chopped dark chocolate and cream. Microwave on high for 30 seconds at a time, stirring in between, until the chocolate is melted and smooth. Take care not to overheat the chocolate. 2) Pour the ganache over the top of the chilled cheesecake and spread to the edges with an offset spatula. Garnish the with white chocolate shavings if you wish. Refrigerate until ready to serve. This recipe was adapted from Gimme Some Oven. 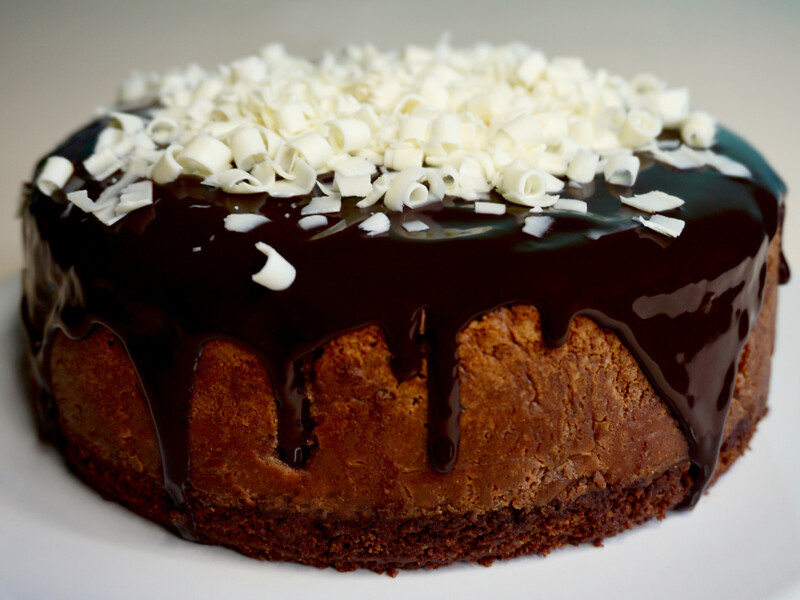 This entry was posted in Blog and tagged Bailey's, cheesecake, chocolate, dessert, ganache, Irish cream, recipes, Shortbread, St. Patrick's Day.